Hogue OverMolded Shotgun pistol grips feature our new Tamer grip technology. 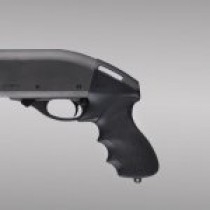 Hogue manufactures the grip used on the Remington 870 which incorporates a Sorbothane insert under the web of the hand. The exclusive Hogue Tamer pistol grip features Hogues' famous orthopedic hand shape with compound palm swells and proportioned finger grooves and utilizes an internal Sorbothane recoil cushion that dampens the painful recoil of magnum loads.